A letter of correspondence from A. C. Hahn to L. A. Bryant dated December 17, 1968. At the time that the letter was written, Hahn was the Acting Regional Director of the U.S. Post Office Department and Bryant was the Postmaster for the Downtown Orlando Post Office, located at 51 East Jefferson Street. 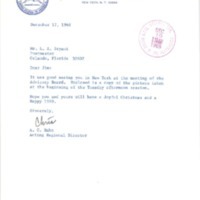 In the letter, Hahn discusses an Advisory Board meeting that the two attending in New York and wishes Bryant a joyful Christmas and happy new year. The attached photograph shows the Advisory Board meeting. Original 1-page typewritten letter from A. C. Hahn to L. A. Bryant,December 17, 1968: Private Collection of Texann Ivy Buck. Digital reproduction of original 1-page typewritten letter from A. C. Hahn to L. A. Bryant,December 17, 1968. Originally created by A. C. Hahn. Hahn, A. C.. “Letter from A. C. Hahn to L. A. Bryant (December 17, 1968).” RICHES of Central Florida accessed April 21, 2019, https://richesmi.cah.ucf.edu/omeka/items/show/7389.